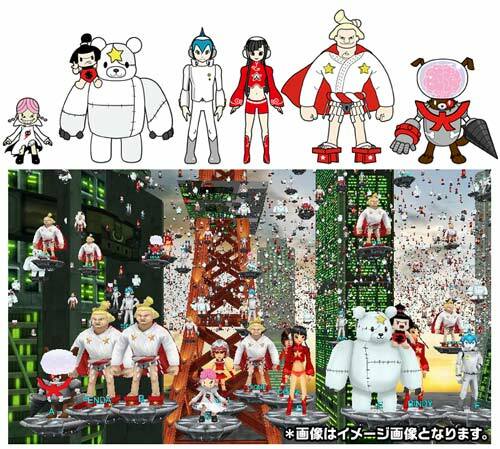 TV Asahi has joined forces with Artificial Life to pilot a so-called interactive mobile participation television program, titled ‘Hoshi-ichi Owarairyoku Test’, which is scheduled for a one hour debut on 14 June. The concept of this show, loosely translated, is a search for the planets (or at least Japans) funniest entertainer. Legions of mobile users will be represented on-screen, live in real time as custom 3D avatars on a system that can apparently scale to animate 100,000 concurrent identities, will participate in the contest. What are you waiting for.. advance registration starts today! 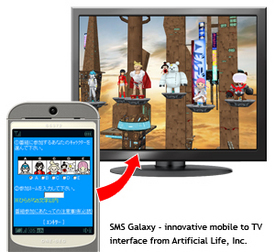 Artificial Life is providing their unique 3D scene engine and mobile TV interface technology, called SMS Galaxy. The service enables live TV broadcasters to support real-time viewer interaction with their shows using their mobile phones. Viewers may use the mobile web to register before or during a show to select their on-TV screen name along with their animated 3D avatar of choice. In the television studio, a real time joystick control allows a studio operator to generate a camera path flying through the 3D scene of all participating viewers’ avatars. The Japanese celebrity, Kendo Kobayashi, will host the program and guide viewers through the innovative one hour game show format. We’re thinking it should do well here too!